We are pleased to introduce our 100% Certified Organic Cotton Wolf shirts. 100% grown, sewn and printed in the USA. 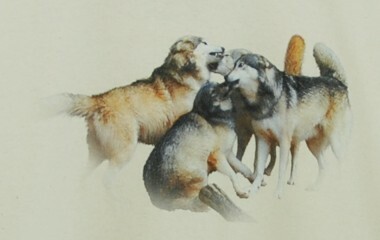 The Wolf T shirt, Pack Rally is our very first organic design. The graphic is of our Wolves. Rally around American farmers and the environment with this made in USA organic t-shirt. Machine wash and tumble dry low. We turn our t-shirts inside out to help preserve the beautiful artwork.